Update: The winner of the giveaway is Kerrie G. Thanks so much to everyone who entered! I am excited to announce that I have been selected to participate in the I Can’t Believe It’s Not Butter!® Holiday Bake-Off on Friday, November 12! The Bake-Off includes an all-expense paid trip to New York City to bake a holiday dessert recipe with nine other bloggers at the Unilever Test Kitchen. 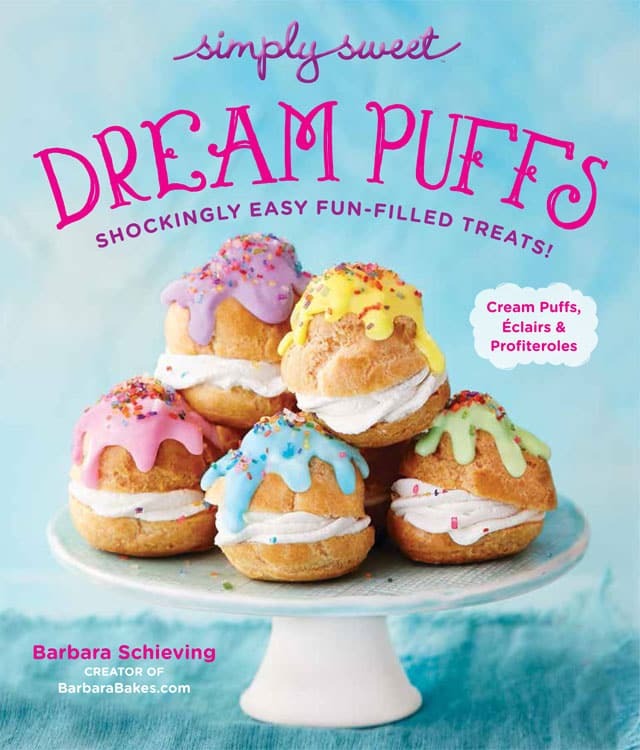 I also have good news for Barbara Bakes readers! I Can’t Believe It’s Not Butter! is hosting a giveaway for readers of the Bake-Off contestants’ blogs, tailored to the contestants’ Bake-Off recipes. One lucky commenter from each blog will win a prize package to help them recreate the featured holiday dessert recipe. 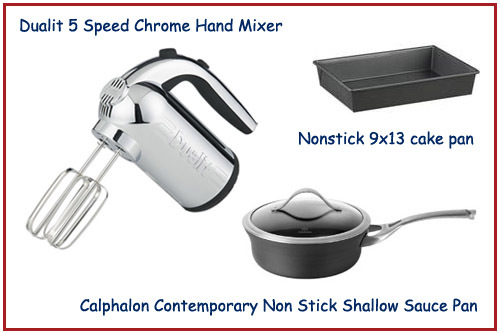 The winner of my giveaway will recieve a Dualit 5 Speed Chrome Hand Mixer, a Calphalon Contemporary Nonstick Shallow Sauce Pan, a nonstick 9×13 cake pan, and a coupon for a free I Can’t Believe It’s Not Butter! product. Entry details are at the bottom of this post. As part of the judging process, the blogger participant who receives the most comments by the end of this giveaway will receive extra points towards their total score. 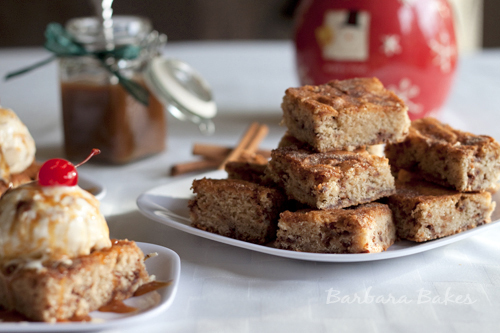 Last year I created a Snickerdoodle Bread that incorporates the flavors of a Snickerdoodle cookie. 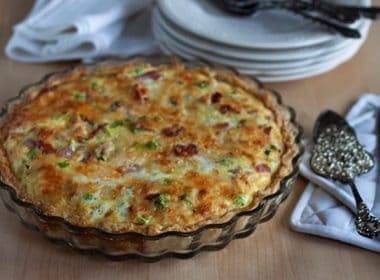 It is absolutely delicious and was an immediate family favorite. 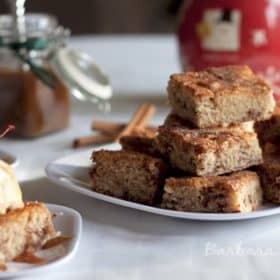 The crisp cinnamon-sugar coating with the rich buttery middle seems perfectly suited to the holidays; so for the Bake-Off I decided to give my Snickerdoodle Bread a makeover to reduce the saturated fat and cholesterol and created this Snickerdoodle Snack Cake recipe. To eliminate roughly 1,200 mg of cholesterol and 168 grams of saturated fat, I replaced butter with cholesterol-free I Can’t Believe It’s Not Butter! and replaced the sour cream with non-fat Greek yogurt. I am confident that no one would be able to taste the difference between butter or I Can’t Believe It’s Not Butter! in this dessert. I also made a couple of other changes so that it could be baked in 9 x 13 pan and served as a special holiday dessert. I topped my Snickerdoodle Snack Cake with a scoop of Breyers Smooth & Dreamy reduced fat vanilla ice cream and a drizzle of Cinnamon Caramel Sauce. This snack cake is not a light and fluffy cake. 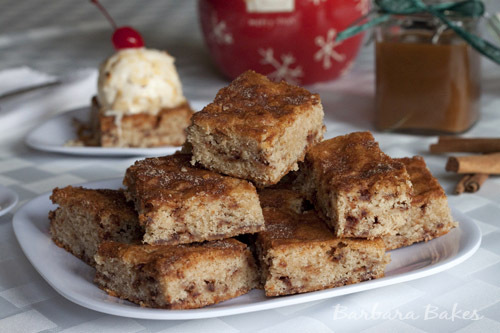 Its more like a cross between a brownie and banana bread topped with a crinkly cinnamon-sugar crust. Its perfect for a mid-day or late night snack. 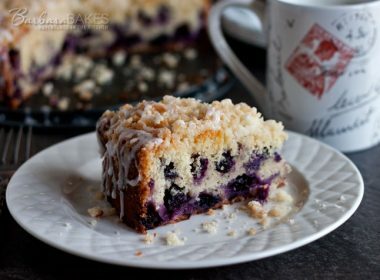 It would also be great served as a coffeecake for breakfast with icing drizzled on top. 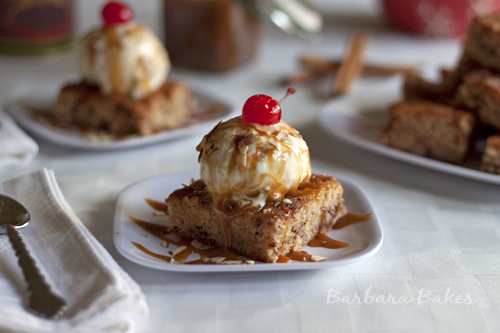 Or you can do as I did and create Snickerdoodle Ice Cream Sundaes for a spectacular holiday dessert. Whisk together the flour, baking powder, salt, and cinnamon in a medium bowl; set aside. In a large mixing bowl, beat together I Can’t Believe It’s Not Butter! Sticks and 1 1/2 cups sugar until fluffy, about two minutes on medium speed. Beat in eggs one at a time, mixing well after each addition. Mix in vanilla and yogurt until well blended. Mix in flour mixture just until blended. Toss the cinnamon chips with 2 T. flour; stir into batter. Evenly spoon batter into prepared pan. Mix 1 tablespoon sugar and 1 teaspoon cinnamon; sprinkle cinnamon sugar evenly over the top of the batter. Bake at 350º for 35 to 45 minutes until a toothpick inserted into a crack in the center of the cake comes out clean, the cake is pulling away from the edges of the pan and the center feels firm. Remove from oven and let cool completely before serving. 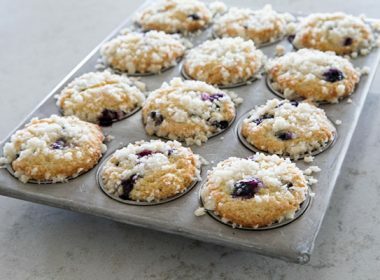 Note: For smaller gatherings, this recipe is easily divided in half and baked in an 8×8 pan. Whisk together caramel ice cream topping and 1/4 teaspoon cinnamon in a small saucepan over medium heat until warm. 1. Leave a comment on this post and let me know if you’re a chocolate lover and always choose a chocolate dessert, or if you prefer a non-chocolate dessert. 2. 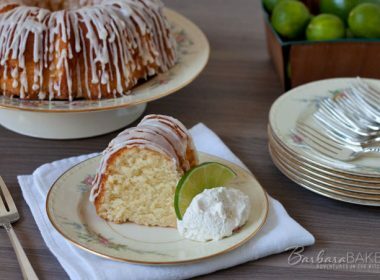 Subscribe to Barbara Bakes or Subscribe to Barbara Bakes by email and leave a comment on this post letting me know you subscribed or already subscribe. 3. 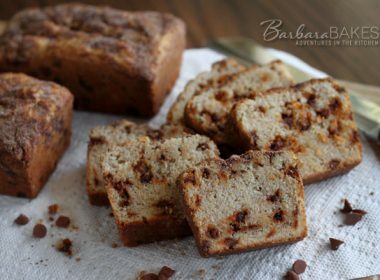 Like Barbara Bakes on Facebook and leave a comment on this post. 4. 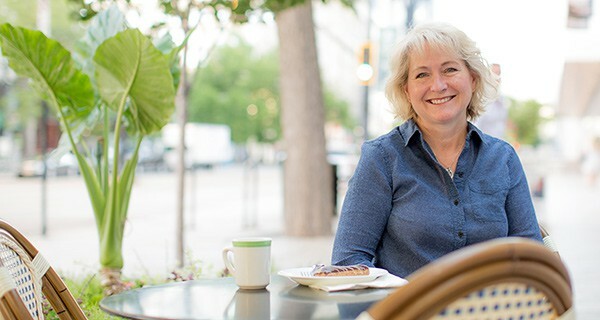 Follow Barbara Bakes on Twitter and leave a comment on this post. 5. Stumble this post and leave a comment on this post. For each additional entry, YOU MUST LEAVE A SEPARATE COMMENT FOR IT TO COUNT! The giveaway closes on Friday, November 12, at 8:00 am EST. The winner will be chosen by random number. Only comments on this post will be entered. You must include your e-mail address to be entered in the giveaway. This giveaway is open to residents of the USA only. Here are the other I Can’t Believe It’s Not Butter Bake-Off Contestants. Be sure and visit them to see their Bake-Off recipe and enter their giveaways. Choose a chocolate dessert all the way! I am a huge chocolate fan and always prefer a chocolate dessert! Even so, this recipe sounds good! I do like other desserts almost all of them lets not discriminate now. I prefer chocolate, but I don’t discriminate against sweets! I can’t wait to try this recipe! I prefer non-chocolate desserts, but I’ll try anything that’s sweet! I’m a huge chocolate lover, but lately, I’ve been reaching for fruit desserts instead! SOmeday [soon] ,i hope it will and would love to bake this cake , i love how well u described the type of texture we are looking at here!